Buzz! Robin Hood & Russell Crowe Week At The Scribe’s Desk! 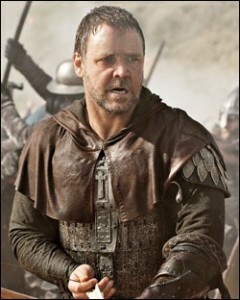 Can you tell I’m a big Robin Hood/Russell Crowe fan? Ever notice how before a huge movie is about to come out in theaters, TV stations play all the movies that the star of the highly anticipated upcoming feature film is in? If that star happens to be one of your faves, then you could be in for quite the thrilling marathon. I guess this week is good for me then! Since I am and have always been a lover of anything Robin Hood, all week at The Scribe’s Desk is Robin Hood and Russell Crowe Week! So as you can see, I’m certainly getting psyched up for Robin Hood. Are you? Awesome Movies Playlist, marathon, movie, Robin Hood, Russell Crowe, TV. Bookmark.